Another record: THON 2014 wrapped up Sunday with $13,343,517.33 raised in the fight against pediatric cancer. 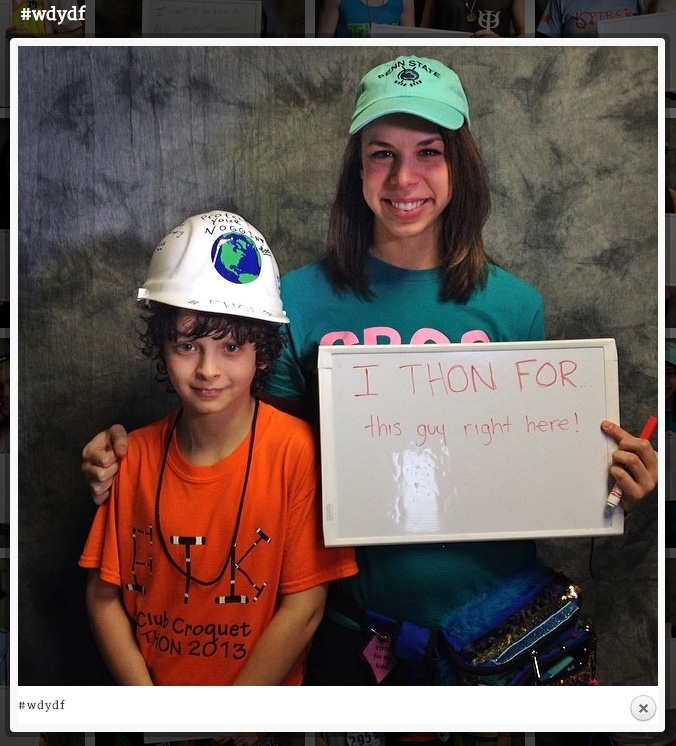 There’s lots of great coverage today, including photos, video, and stories at Onward State and the Collegian, but our friends at the College of Communications shared a unique collection of images you might’ve missed: a collection of Instagram images (like the one above), taken by student journalists, of THON dancers, support staff, and families. The theme: “Who do you dance for?” Very cool stuff. What a finish: David Taylor and Ed Ruth will go down as two of the best wrestlers in Penn Stater history. Our in-house wrasslin’ expert, Lori Shontz ’91, ’13g, was at Rec Hall Sunday to watch Taylor and Ruth in their final home matches in a dual meet against Clarion. How’d they do? Let’s just say both guys barely broke a sweat. Our editor, Tina Hay ’83, posted some great photos at that link, as well. Board bets: Gov. Tom Corbett has nominated a pair of alumni to fill the Board of Trustees posts currently held by Ira Lubert ’73 and Alvin Clemens ’59. The nominees are Cliff Benson ’71, an executive with the NHL’s Buffalo Sabres who was instrumental in securing the nine-figure gift from Terry Pegula ’73 that allowed for the creation of Division I hockey at Penn State; and Todd Rucci ’92, a football letterman and former director of the Pennsylvania Lottery. ‘Eers to Scrap: Tom Bradley will be back on the sidelines this fall. A longtime member of Joe Paterno’s staff, Bradley ’78 was hired by West Virginia on Friday to be the Mountaineers’ senior associate head coach. Bradley, who had worked as a radio analyst the past two years, served as the Nittany Lions’ interim head coach for the final four games of the 2011 season. Entry filed under: Board of Trustees. Tags: Alvin Clemens, Cliff Benson, Ira Lubert, Todd Rucci, Tom Bradley, Tom Corbett, West Virginia.